Sign up now and I'll send it over to you. Your pdf includes all these groups of symbols. There's more detail below. 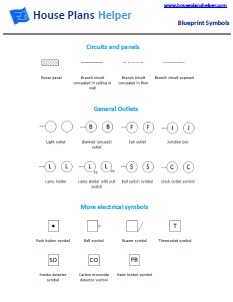 All the blueprint symbols for fixtures wired in directly such as fans and bells. 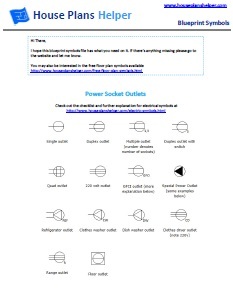 All the electric blueprint symbols for outlets, wall mounted and floor mounted, 120 and 240 volts, specialized outlets. 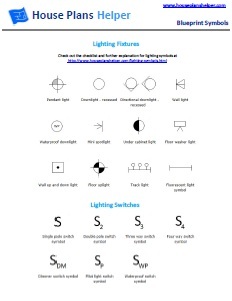 A page of lighting symbols - both fixtures and light switches. Have a look at the home lighting design section for more info on lighting. Figure out all that fancy hi-tech wiring for data, comms, TV and sound. Make sure you're happy with the positioning of all your HVAC vents. 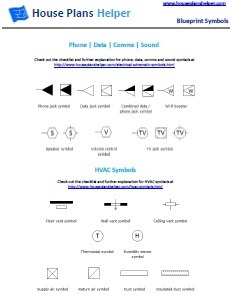 I’m always interested to hear feedback on your blueprint symbols pdf. Is there anything missing? Which ones do you find the most useful? 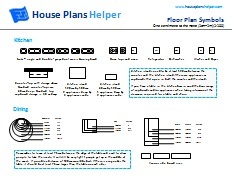 Are there any new trends in household systems that we should be checking in our blueprints? Please contact me and let me know. 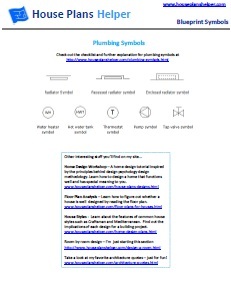 Please remember though that not all of the blueprint symbols are standardised, so you might see a different version of a wall mounted light somewhere – I had to pick one of them! If you know others who would find the pdf useful then please encourage them to sign up rather than just forwarding it. Everyone on the email list receives updates to the pdf when I make them. If they're on the list they'll always be up to date with their blueprint symbols.